I am honored to be telling my story as a peace builder, and an immigrant in the United States of America. I met my partner David Wick in 1999. He worked with Avon Mattison and Joanie (Misrack) Ciardelli since 1980 on the foundation of Pathways To Peace (PTP) which became a United Nations NGO. Pathways To Peace then developed Consultative Status with the United Nations Economic and Social Council, and works with the U.N. Centre for Human Rights, U.N. Centre for Human Settlements, UNESCO, UNICEF and other Agencies. It is also an official Peace Messenger of the United Nations. I arrived in New York’s Chinatown from Hong Kong in 1965 at the age of fifteen, not knowing how to speak English. I learned quickly that for me to survive, I had to learn the language, get educated and assimilate into the American culture. In the process, I learned to be a keen observer of both cultures. I soon recognized and retained what serves me. From the Chinese, I work hard, fiercely adhere to devotion, discipline and humility, from the American, I am creative and daring to forge new paths. I am a quick learner, I apply what I learned into practices, therefore, I created my own culture. David introduced me to Avon Mattison not long after we met. I joined PTP as a director and assisted in various projects and created the Culture of Peace Initiative logo which is seen on this CPI newsletter and a print of this image hangs in the United Nations. On September 21, 2015, the International Day of Peace, David and I launched the Ashland Culture of Peace Commission (ashlandcpc.org) which was based on the years of experience working with PTP and the United Nations. This was a unique opportunity to organize on the ground, in a dynamic and creative community and a small city, the principles, practices and insights of what a Culture of Peace can be. How can we produce positive peace events, that open peoples hearts as well as their minds? A week before the launch of the Ashland Culture of Peace Commission, I traveled to the UK for an art exhibit created by Banksy with my daughter. We decided to visit Wales since we had rented a car. 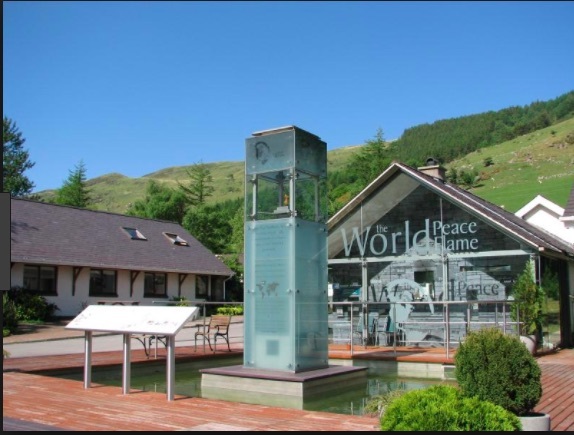 Deep in the Snowdonia Mountains, I needed to turn my car around to go back to town and I turned into an outlet behind the mountain and I was stunned to see a glass monument with a flame near the top with the words “World Peace Flame” etched on the glass. I gazed at the flame in awe. The flame ignited the sacred flame in my heart and I knew instantly, peace starts with me – I am the flame. In 1999, seven sacred flames from five continents were joined in Wales to become the World Peace Flame. The Asian flame was lit from the eternal flame at Gandhi’s memorial. My deep desire to bring the World Peace Flame to Ashland, Oregon, USA is to share the inspiration with each person to take responsibility to practice peace. There is only one other World Peace Flame in the United States, it is in the Civil Rights Museum, Memphis, Tennessee, the assassination site of Dr. Martin Luther King. Peace is not just a concept or to help some other causes in faraway places. It is a daily practice. I experienced and learned about tremendous anger in communities in our country and in the world. Anger is an expression of deep passion; the same fierce passion also was expressed by Gandhi and Dr. Martin Luther King for peace. It is a choice. My family is from China, immigrants to the United States. Many of us are immigrants in this country. I am proud to be an American. I am not defined by the US national politics. I traveled to many countries and experienced many cultures and America is the only country that offers freedom and the opportunity for a girl from New York Chinatown, who did not speak English, to have a vision and then through hard work and determination is bringing the World Peace Flame to the United States. The World Peace Flame is being lit on the International Day of Peace, September 21, 2018 in Ashland, Oregon. There is only one race in this country and in the world – the Human Race. We have different history and habits, but we share the same humanity. We put the stake in the ground, we light the World Peace Flame along with the sacred flame in our hearts. We declare that we are defined by our desire and action to bring peace to ourselves and to the world. We unite with our hearts to protect and care for each other, our children, our community, our country and our planet. We choose Peace.